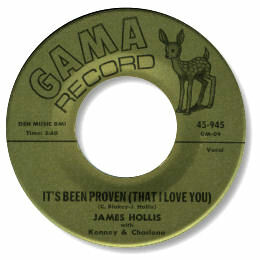 From Washington DC comes this subtle ballad led by the sweet tenor vocals of James Hollis. It's Been Proven (That I Love You), his tale of love is well backed up by some fine background singing (Kenney and Charlene? ), a rudimentary rhythm section and the occasional interjection from a small horn section. This sort of low budget production has produced some of deep soul’s most hallowed tracks and this very rare piece is a welcome addition to their ranks.